Get out of school, and into your inline skates. The sun is shining, and the skate park is waiting. Among friends, the children skate around laughingly through the city, skate with enthusiasm on a bet, or skate concentrated down winding hills. Full of thrill, they drop for the first time into the mini ramp, try their hand at the flat curbs, or make soft jumps over the fun box. Inline skating is a hobby and a passion, an emotion and a lifestyle - for adults and for children as well. 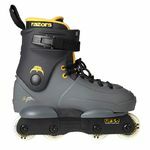 We at Grindhouse are experts on inline skates and offer in our online store a wide range of skates for our young customers. Want to buy the perfect gift for active boys and girls, children, and sport-loving adolescent acrobats? Then take a look here in our store. Here you'll find the best models for ramps or slippery roads, for doing tricks or for cruising, and for yourself or as a gift. Grindhouse brings you the latest junior models of universally recognized and esteemed manufacturers such as Powerslide and Roces, Seba, Razors, and USD. Our inline skates for young trainees stand for safety and skating pleasure as well as stability and comfort. In the Grindhouse shop, you can also find matching accessories and appropriate protective equipment, fast wheels, or robust ball bearings to give to the little skaters as a gift. Whether it's just for fun or with courage and vigor - kids love roller blading. With good reason.